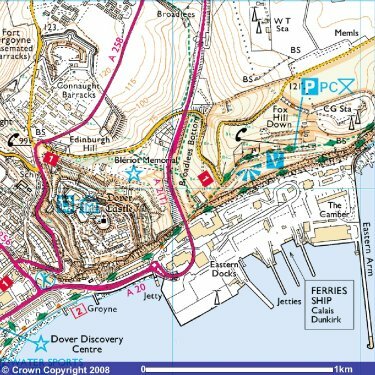 Dover has a huge system of military tunnels cut into the white chalk cliffs above the ferry terminal. 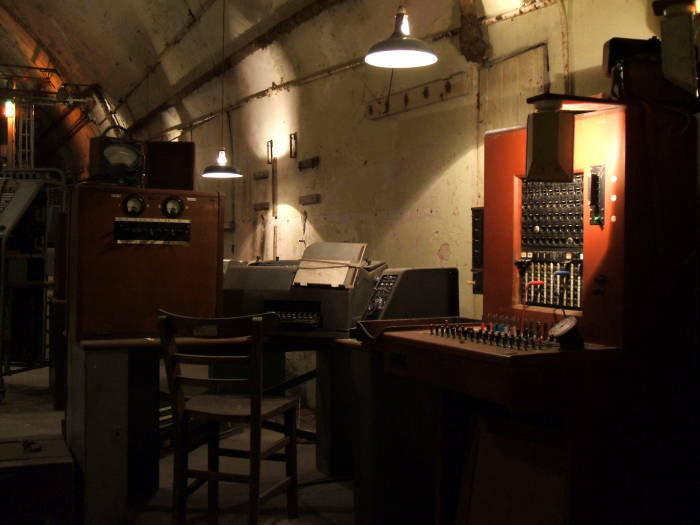 These tunnels date back to the Napoleanic Wars, although they're now most famous for their use as a military command post during World War Two. 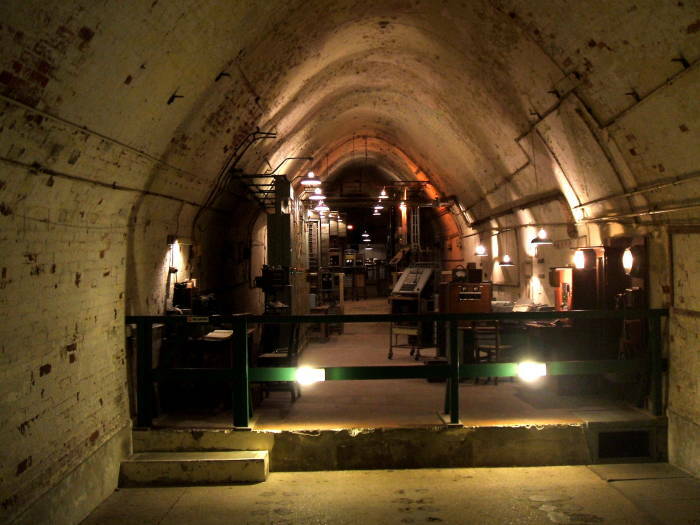 The underground complex remained in use through the Cold War until 1984. 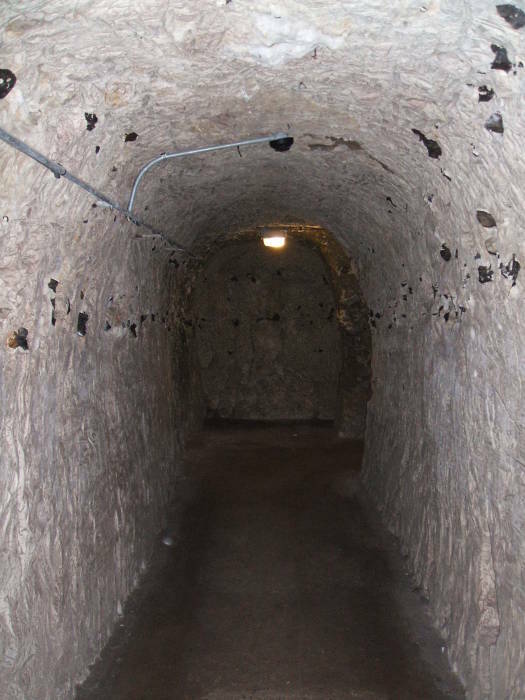 These tunnels are cut through the white chalk below the prominent castle. The castle was initially built in the 12th century, and the area was occupied during the Iron Age before the Roman invasion of 43 AD. "The tunnels were first excavated between 1797 and 1802 to provide extra accommodation for troops stationed at Dover Castle. 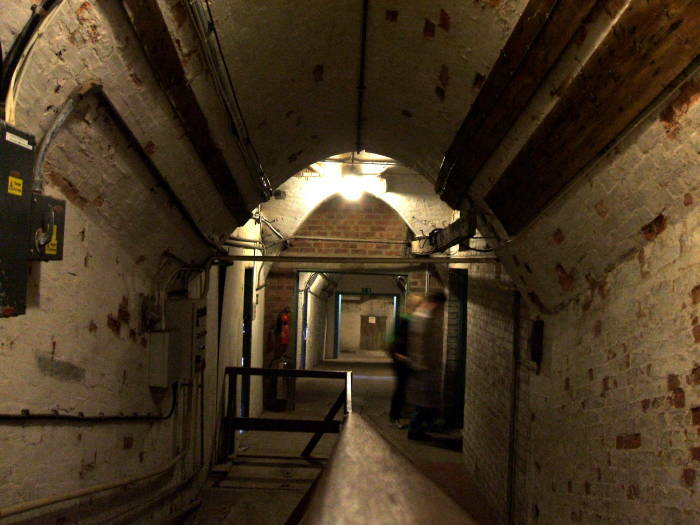 In 1938 these original tunnels were modernised to become in part the naval headquarters of Vice-Admiral Bertram Ramsay, in charge of naval operations at Dover. The castle's defences, along with coastal artillery were also controlled from the tunnels." "Immediately before war broke out in 1939, Vice-Admiral Ramsey had been in charge of converting the abandoned underground barracks into a naval headquarters, with an operations room, offices and living quarters. Also here were the coastal artillery operations headquarters, an anti-aircraft operations room and the headquarters of the fortress commander." 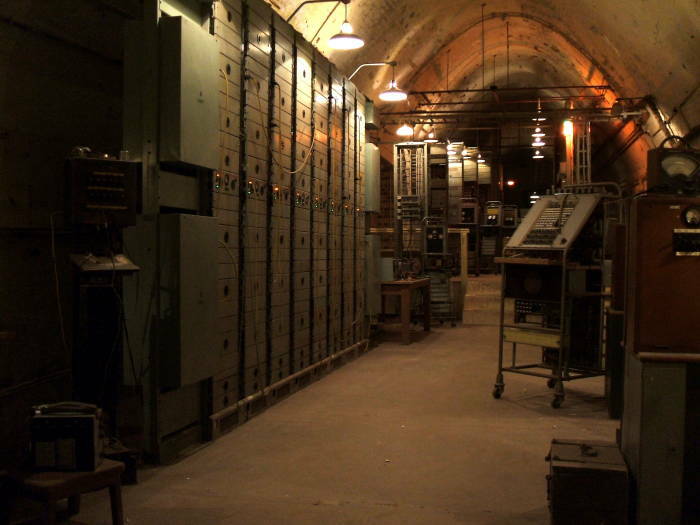 "Following the fall of France in 1940, the original tunnels of Casemate level were extended by two further levels. Above came Annexe, constructed as a secure underground hospital. 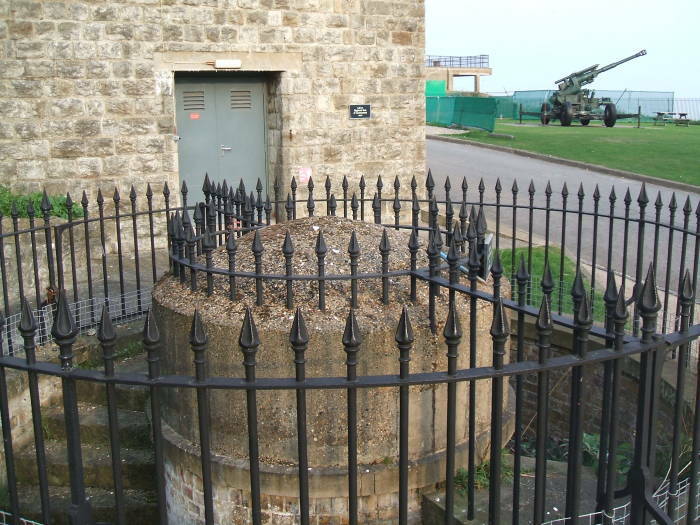 Below came Dumpy, its larger spaces designed to be the heart of a new Combined Operations Headquarters for the Royal Navy, Royal Air Force and the Army, jointly charged with protecting the Straits of Dover and the coast of Kent." 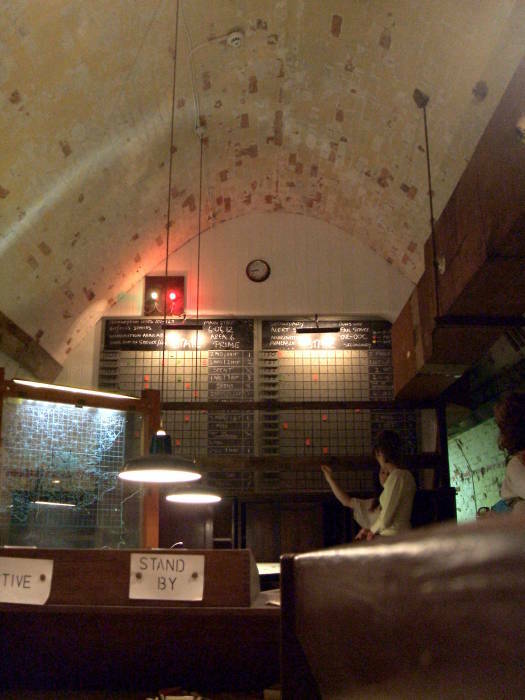 What has been opened in the early 2000s are the WWII facilities — the Casemate and Annexe levels. Sensor data was collected, organized, and analyzed here. Definitely radar data, plus visual sightings of enemy ships and aircraft. Plus, probably, signal intercepts of German aircraft. Commands for intercept fighter missions and artillery fire were then issued from this complex. Some of the data would have come from the Chain Home radar network, including a site just about 1.5 kilometers to the north-east. See my other page for pictures of the Swingate Chain Home radar site. 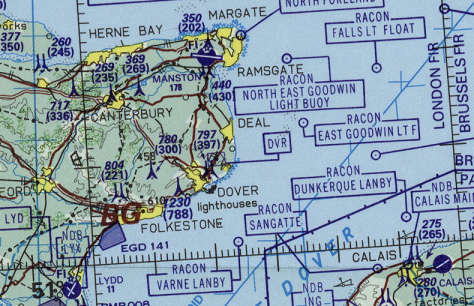 Here is a small piece of Operational Navigational Chart E-1 showing Dover and the short distance to the French coast. It's just 22 miles from Dover to Calais. Below are 1:50,000 and 1:25,000 maps. The castle is immediately north and overlooking the center of the harbor. If you arrive by train, see Priory Station in the 1:50,000 map. The Swingate Chain Home radar site is shown as three radio masts to the north-east of the castle. It's marked on the 1:25,000 map as "W T Sta" for "Wireless Telegraphy Station". "C G Sta", or "Coast Guard Station", is a relatively smaller facility near the edge of the cliffs. Dover Castle overlooks the city of Dover. You see it as you walk toward the center of Dover from the Priory Station rail station. 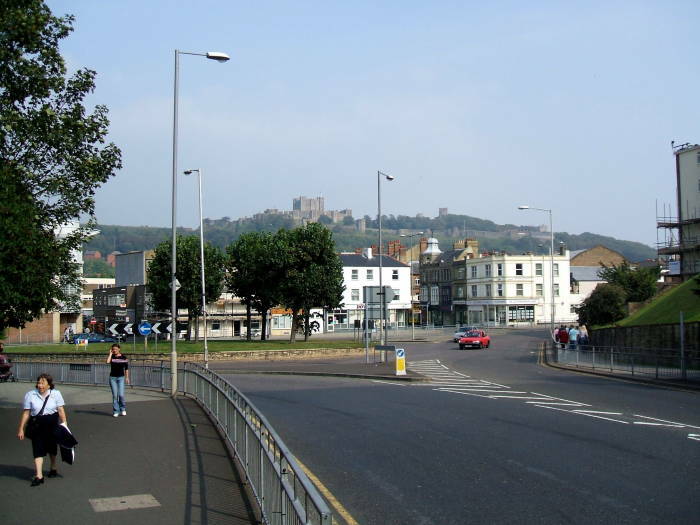 Pass through the center of Dover and climb the hill to get to the castle. Dover Castle as we see it above ground today was initially built in the 12th century. The site may have been fortified with earthworks in the Iron Age or even earlier, before the Roman invasion in AD 43. Archaeological excavations have found evidence of Iron Age occupation of the area, but it is not certain that this was associated with the fortress. The site was occupied back in the Bronze Age, when a large mound was created. The Romans built a Pharos or lighthouse on the large mound. Then the English built a church there some time after the 12th century. Then he marched to Dover, which had been reported impregnable and held by a large force. The English, stricken with fear at his approach had confidence neither in their ramparts nor in the numbers of their troops ... While the inhabitants were preparing to surrender unconditionally, [the Normans], greedy for money, set the castle on fire and the great part of it was soon enveloped in flames ... [William then paid for the repair and] having taken possession of the castle, the Duke spent eight days adding new fortifications to it. The castle was first built entirely out of clay. It collapsed to the ground and the clay was then used for many of the ground floor rooms. This work may have been repairs on an ill-fated clay fortress built by the Saxons, although it seems that William started new construction. The castle began to take the shape we see today under Henry II, when the inner and outer baileys and the great keep were built. A group of rebel barons asked Louis VIII of France to come and take the English crown in 1216. His forces breached the walls at the north gate but were unable to take the castle. That gate was converted into an underground forward-defense complex including Saint John's Tower, and new gates were built into the outer curtain walls on the eastern and western sides. Yes, an underground forward-defense complex. The English defenders had tunneled out and attacked the French besiegers, creating the only known counter-attack tunnel in the world. The Napoleanic Wars at the end of the 1700s brought massive rebuilding projects to the castle. It was starting with a geographic advantage for defense against sea-borne forces, as it was at the edge of the cliffs overlooking the harbor. 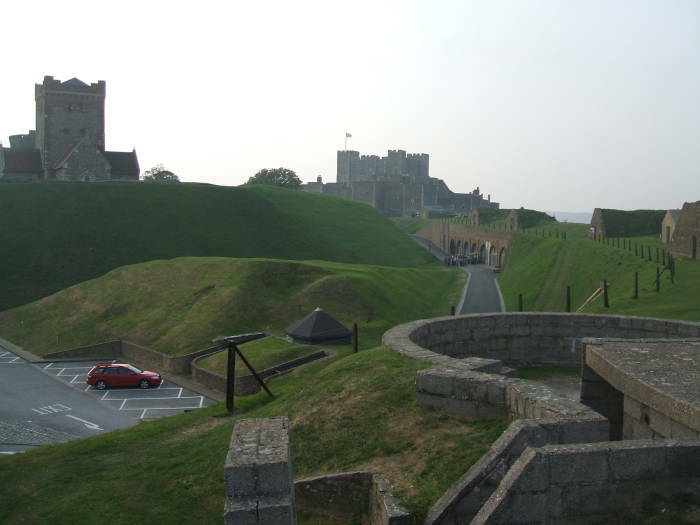 Dover was becoming a garrison town, and barracks and storerooms were needed. Tunnels were excavated between 1797 and 1802, about fifteen meters below the cliff top. More than 2,000 men were housed in these underground barracks at the height of the Napoleanic Wars. At the end of the Napoleanic Wars, the tunnels were partly converted and used by the Coast Blockade Service, which fought smuggling. But they moved out of the tunnel complex in 1826, and it was abandoned for over a century. 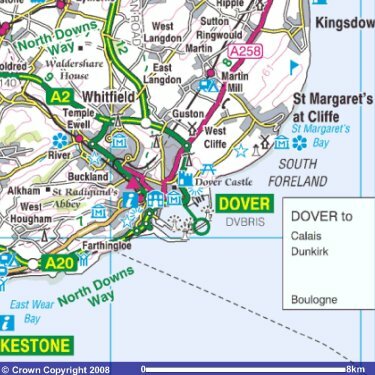 Dover is at the extreme south-east corner of Britain, at the nearest point to the continent. 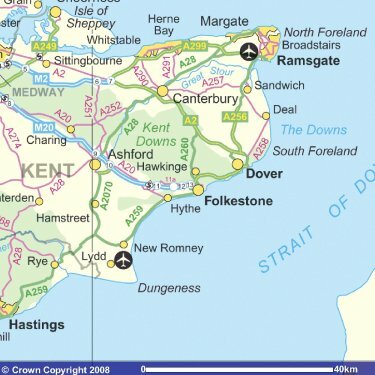 It's just 35.2 km (22 miles) across the Straits of Dover to France. The Dover ferry port is still busy despite competition from the Chunnel, or the Channel Tunnel. P&O Ferries and DFDS Seaways operate services to France from the Eastern Docks. Every day there are almost 40 ferries daily to Calais, and up to 12 ferries to Dunkirk (or Dunquerque as they call it once you get there). P&O is a British shipping company, DFDS Seaways is Danish. 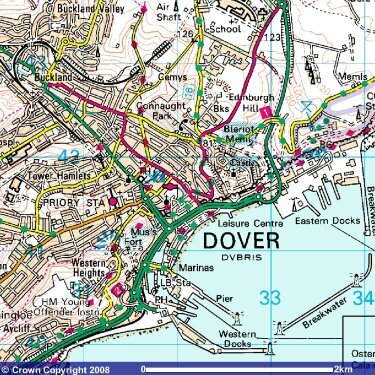 The Dover Harbour Board, formed by Royal Charter by King James I in 1606, still owns and operates the port. Here you see a view down to the harbor from the entrance to the tunnels along the cliff face. Once out of port the ferries have to negotiate what is said to be the busiest shipping lane in the world. There is strict control of shipping traffic. MRCC Dover, or Maritime Rescue Co-ordination Centre Dover, runs the Channel Navigation Information Service, which controls the Dover Strait Traffic Separation Scheme. This allots ships to separate lanes while passing through the Dover Strait. 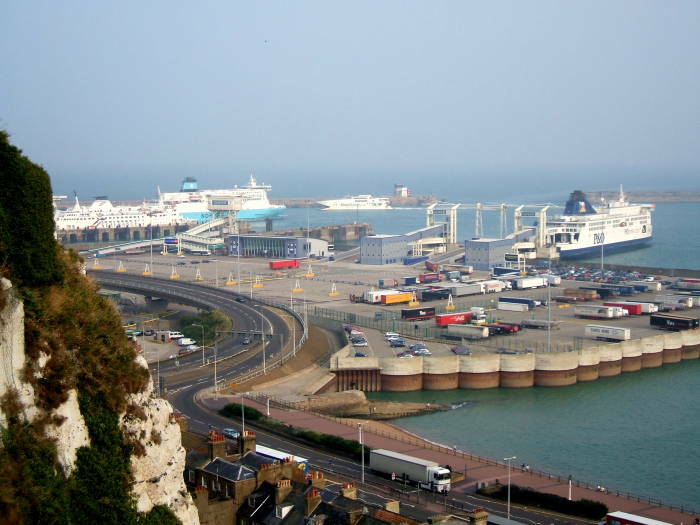 The ferry crossing through those shipping lanes between Dover and Calais takes about ninety minutes. You may see yachts and other personal boats in the port. The Sunseeker yachts for sale are built in the UK and are available around the world. 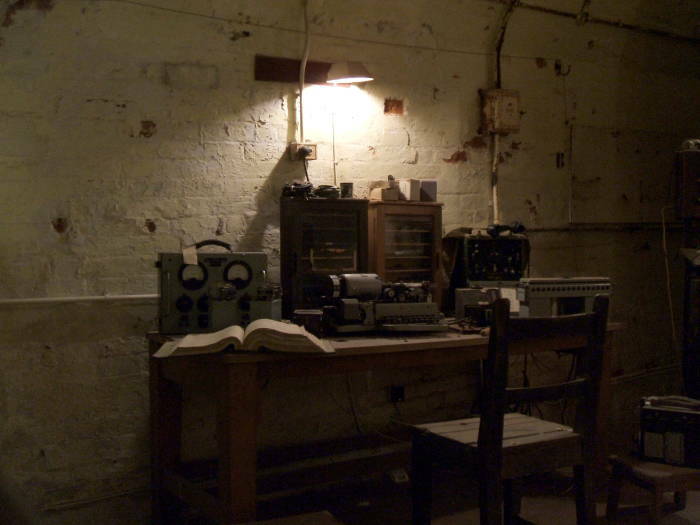 With the outbreak of the Second World War in 1939, the tunnels were first converted into an air-raid shelter and then into a military command center and hospital. The entry today is on the cliff face overlooking the harbor. In May, 1940, Admiral Sir Bertram Ramsey's headquarters were in these tunnels, from which he directed Operation Dynamo, the evacuation of French and British forces from Dunkirk. 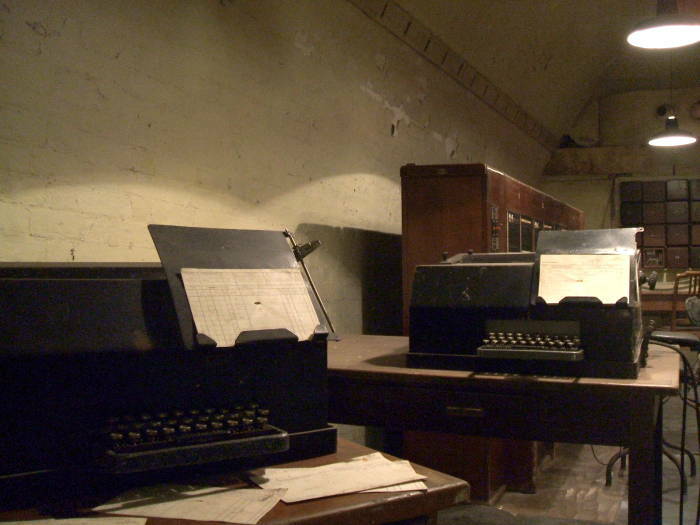 The tunnels were extended, given alphabetical names as you go down: A — Annexe, B — Bastion, C — Casemate, D — DUMPY, for Deep Underground Military Position Yellow, and E — Esplanade. 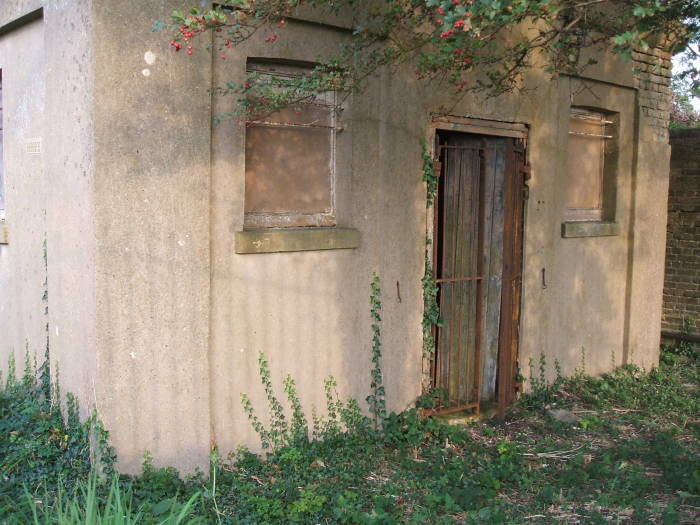 Annexe was excavated in 1941 to create a military medical aid station for immediate care of wounded soldiers. They would receive emergency treatment in these tunnel facilities, including two operating theaters, and then be transferred to inland hospitals. The Annexe level also held dormitories, kitchens and mess halls. After the war, the tunnel complex remained in government service. The DUMPY level was converted to serve as an emergency Regional Seat of Government during the Cold War. It had that continuity of government role from 1963 through 1984, at which point it was finally concluded that the chalk would not provide adequate protection from radiation. Besides, the tunnels were rather inconvenient and in poor condition. The chalk cliff faces are up to 106 meters high, and were formed about 136 million years ago during the Cretaceous Period when the area was submerged under deep tropical waters. Nice to look at, relatively easy to tunnel, but not that good for radioactive shielding. 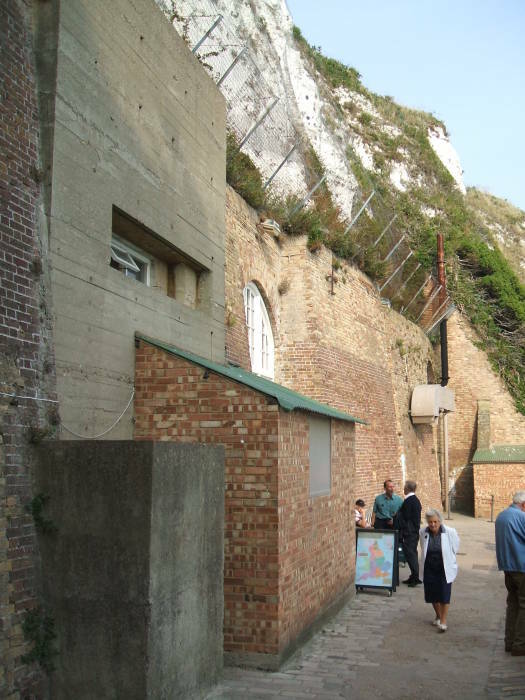 You can now take a tour of some of the tunnels, much of the Annexe and Casemate levels used in WWII. 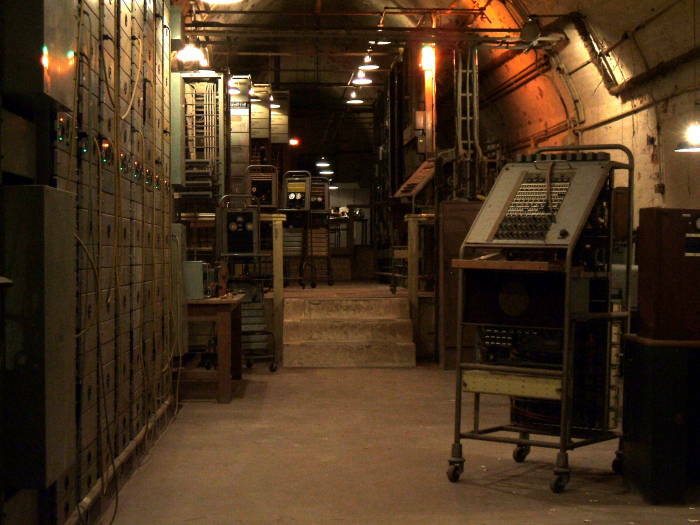 However, the lower levels are still closed as they were used for classified purposes during the Cold War. DUMPY is closed for security reasons, the national government is working to remove classified material and sanitize the area. Esplanade is closed after last being used as an air raid shelter during World War II, or so they say. Full information about the lower levels is not scheduled for declassification until 2020. For more on this facility and all sorts of other underground facilities see the detailed Subterranea Britannica site. The facility gathered reports from radar and visual observation ports, as well as acoustic detection systems. 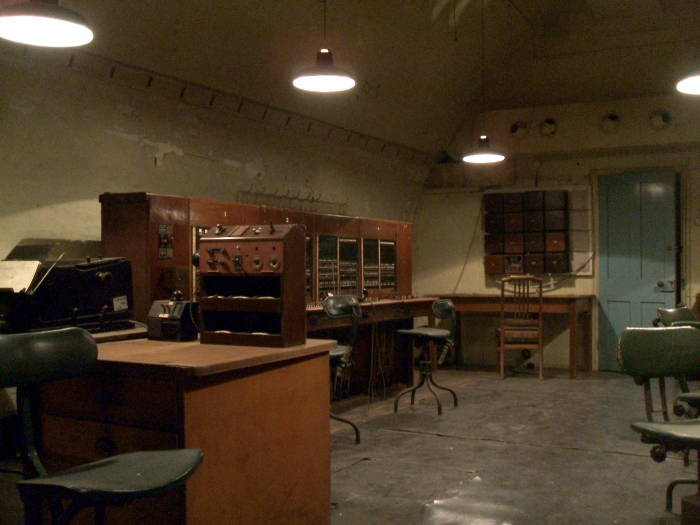 Communications facilities such as these would then relay the information to defense air forces. 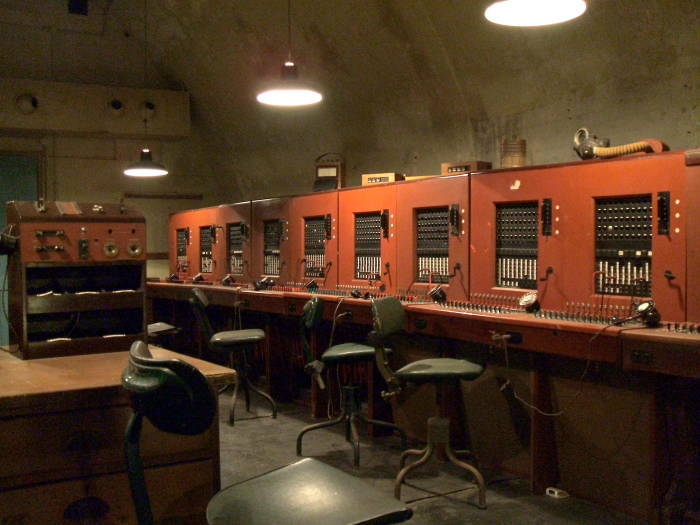 A military telephone exchange was installed in 1941. 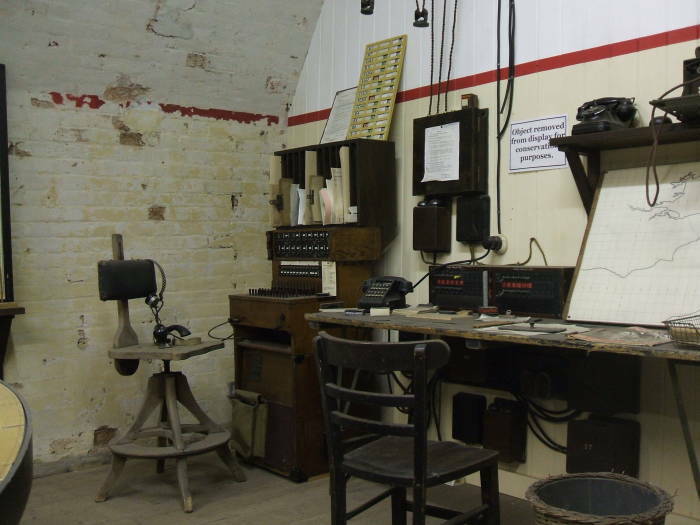 The Royal Navy used the communications exchange to directly communicate with vessels. They could use this capability to direct air-sea rescue craft to pick up pilots shot down in the Straits of Dover. A new tunnel had to be excavated to house the banks of electrical batteries and charging systems needed to keep this system operating at all times. 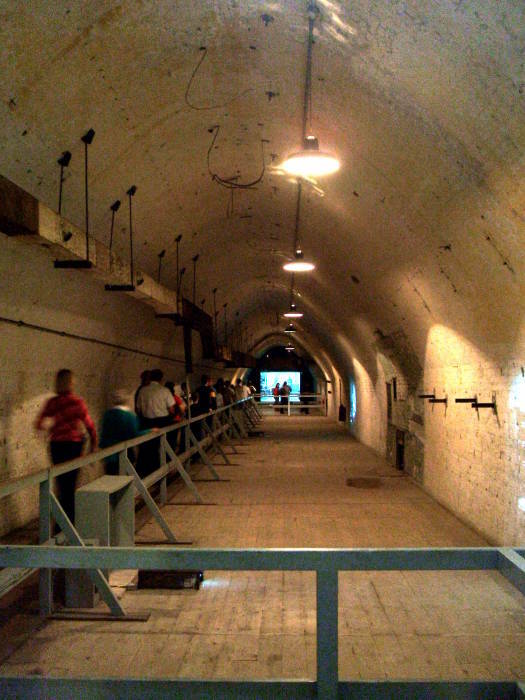 This tunnel between the C3I area and the hospital was used as a work space during the war. 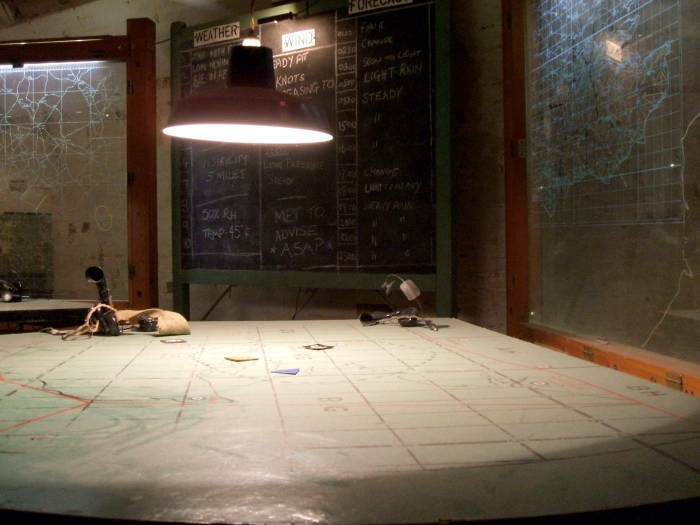 An area with a plotting table was used to track enemy and Allied aircraft. Chest-mounted communication gear connected to overhead wiring relayed position reports. 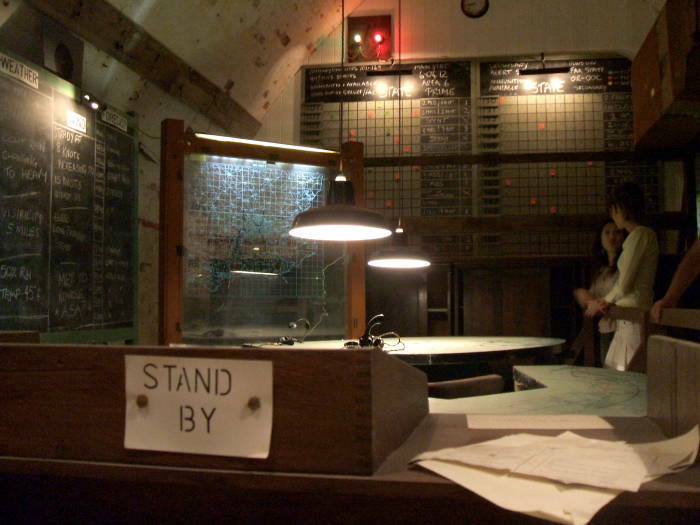 Clear plotting boards stand to either side of another plotting table. 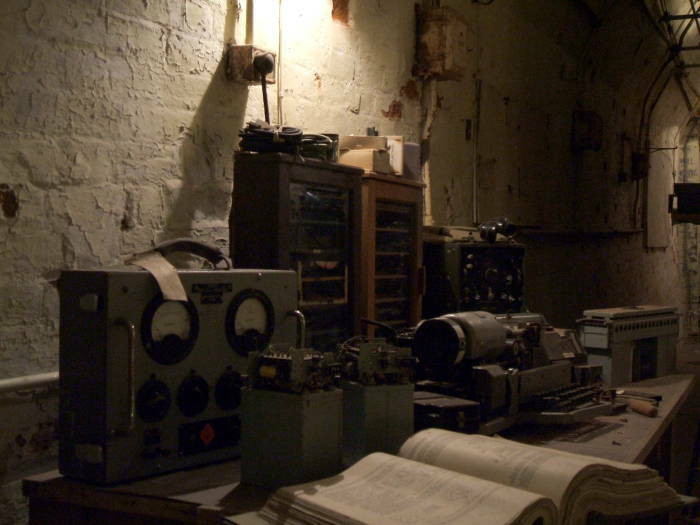 This room was used for tracking and communicating with Allied aircraft. Status boards on the wall at rear indicated the state of those aircraft. A clear plotting board nearby tracked their positions. 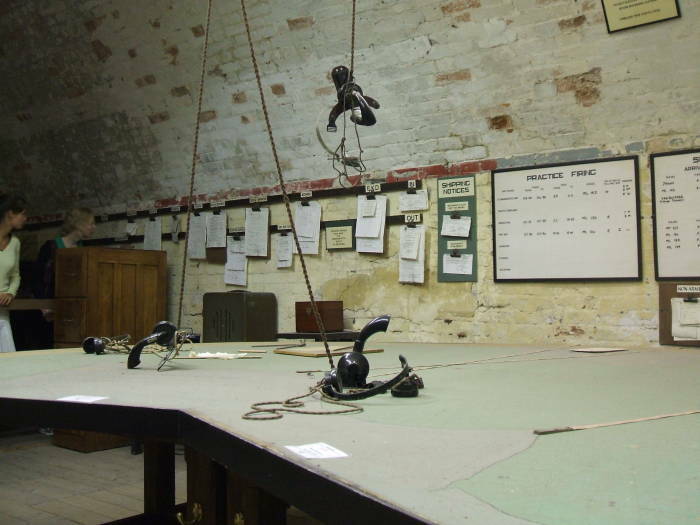 The status and plotting boards are under a barrel-shaped ceiling carved out of the thick layers of chalk making up the cliffs. Dimly lit tunnels connect the larger rooms in the enormous facility. 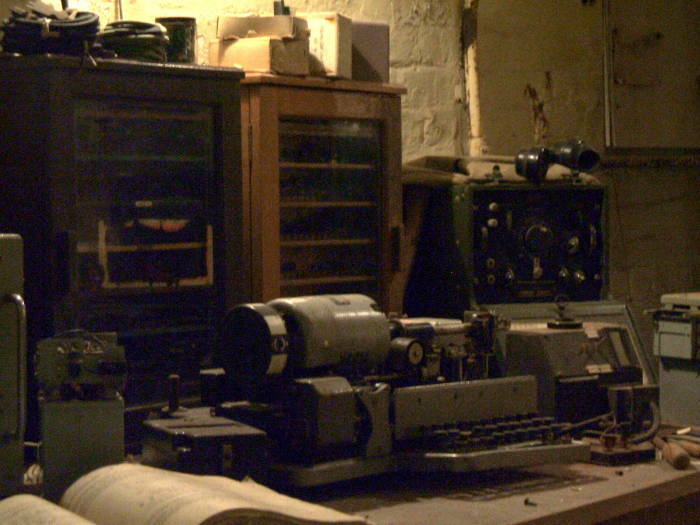 This system in one of the communications rooms looks like a radioteletype reperforating gear (directly in front of the chair) and some test equipment. Reperforating equipment can record a received radioteletype message onto punched paper tape. That tape, and thus that message, could be retransmitted later, or simply stored for later reference. Here's a closer look at the RTTY (or radioteletype) reperforator. 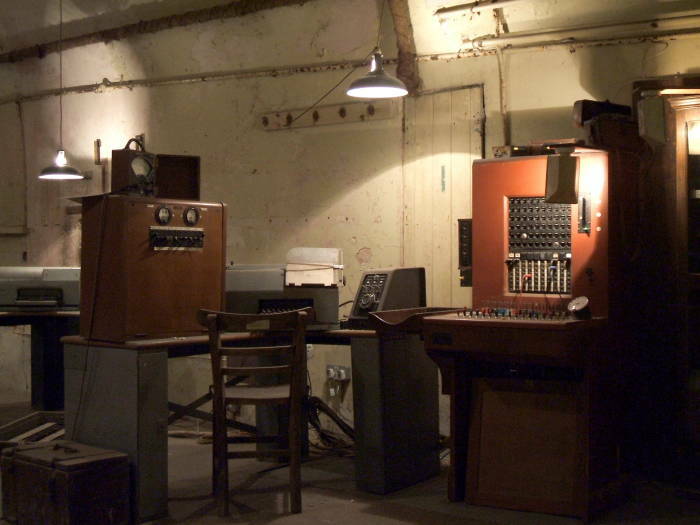 Large racks of signal repeating equipment fill another communications room. A smaller patch panel connects one of the communications rooms. 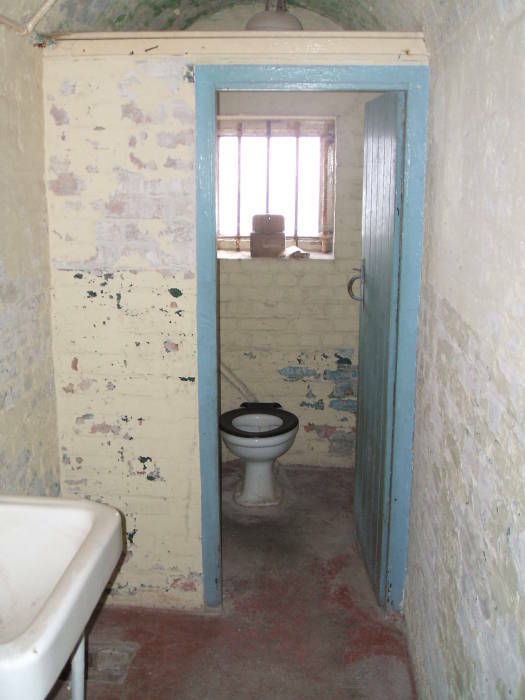 And when you were shut in the tunnels for a long time, you needed all the facilities. People might be in these tunnels for quite a while before they went out into the open air. Also see my Toilets of the World page. 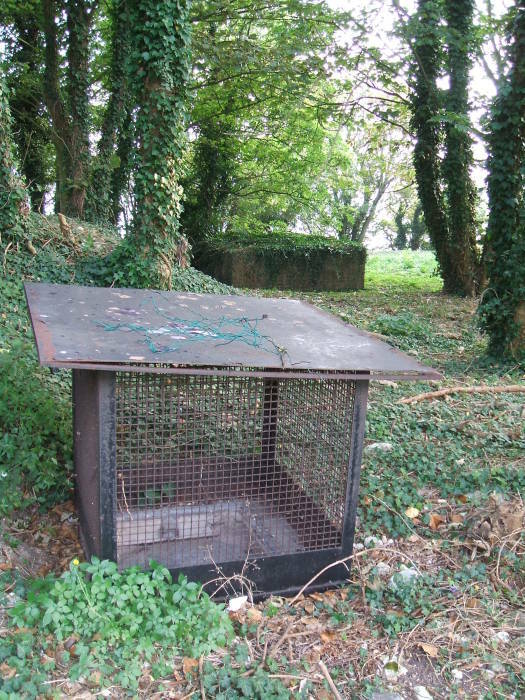 Air vents are scattered through the surrounding woods, as are other remnants of the recent wartime use of the complex. Outside you find one of the Napolean-era entrances to part of the facility. A double spiral staircase doubles the number of men who could enter or exit in a given time.